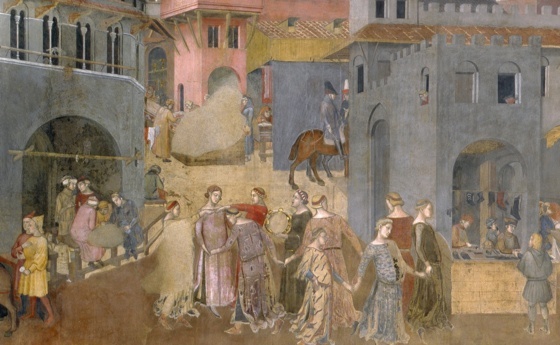 Ambrogio Lorenzetti, detail from “Allegory of Good Government"
Last month I was elected president of The New York Association for Analytical Psychology (NYAAP), our community of Jungian analysts in the New York metropolitan area. This new position has led me to reflect on our vision for NYAAP, and, closely related, the role of community in individuation. NYAAP evolved from a group of analysts who had trained and analyzed with Jung in Zurich and then came together in New York in the 1930s to share their experience and develop their ideas about psychological transformation. They felt that by coming together they could better share what they had learned with the larger community. But more importantly they could amplify their own engagement with Psyche. They formed a learning community, but it wasn’t just academic. Jung consistently offered his ideas as first thoughts—never as the last word. He hoped that his ideas would evolve with the help of others. I see the Jungian community as the best place to develop and adapt his ideas, not a place to preserve them in stone. So it is in that spirit that I cite Jung here—ideas ripe for progress, not relics meant to be worshipped. When Jung defined individuation he explicitly distinguished it from individualism. He believed that individuation is the development of the psychological individual, distinct and differentiated from the collective. He also believed that the freedom to develop our individuality is essential for a healthy, vital, enduring society. Jung saw the development of the individual who could think outside of the box as a bulwark against irrational collective movements, herd mentality. So, seeking to become our true self is necessary not just for our own wellbeing, but for the good of the world. The two are reciprocal: individuation is in service to the community, and vice versa. I agree with him that individuation should lead to more intense relationships with community, not less intense ones. Something different happens when people come together–sometimes beautiful and sometimes ugly—but always an opportunity for illumination and growth. Jung defined individualism as “deliberately stressing and giving prominence to some supposed peculiarity, rather than to collective considerations and obligation.” He also described it as the attempt to impose one’s personal truth onto the community. He saw these as pathological and detrimental to life and individuation. Ideally, he believed, we bring our individual perspectives together to create a mosaic, a blending which creates a larger picture of life, greater than the sum of our parts, and more resilient and adaptive. This process requires both audacity and humility: the audacity to believe something that might run contrary to collective values, and the humility to find a way to integrate that perspective into the collective. As members of NYAAP, we work hard to find the value in our unique voices. And, just as importantly, we need to find a way to harmonize our voices with those of our colleagues. We aim to balance the individual and the collective—one of the many ways we endeavor to hold the tension of the opposites. In one of my favorite essays by Jung, Adaptation, Individuation, Collectivity, he writes that if we try to individuate without community, our individuation is only a pose. He wrote this essay in 1916, during his deep dive into the unconscious. While he continued to see patients in this period, he was otherwise completely absorbed in intense inner exploration. He felt that because he was taking energy away from his engagement with the world, he should eventually offer restitution. In this essay Jung states that we need to adapt both to the unique demands of our own unconscious, and to those of the collective. To the extent that we leave the well-trodden path of the collective, we need to create and offer up equivalent values, objective contributions to the collective that it acknowledges and can actually use. This means that it’s not enough to have some wonderful idea that no-one uses. For Jung, creativity for creativity’s sake is meaningless. So Jung is saying that trying to be your true self is all well and good, but if self-realization doesn’t result in a contribution to society, your individuation is a sham. These are tough words, and I’m not one to believe something just because Jung said it. But Jung’s claim does resonate with my own experience and observation: we are at our best when we feel that we are offering something to our world, and we are our most dispirited when we can’t. This should not be pathologized as “a need to be needed,” but instead valued as one of our greatest aspirations. Mythology also supports this view. You may recall Joseph Campbell’s outline of the hero’s journey, a condensation of millennia of wisdom: the hero leaves his home and ventures alone into the forest of his unconscious, he confronts his demons in the form of monsters of all sorts, and returns home with the boon he discovers there. Without this third step, the hero’s journey is incomplete. As members of NYAAP we bring the results of our personal explorations, our psychological development and our knowledge, to our professional community and then to the larger world. We share this through our training institute, where we prepare individuals to become Jungian analysts, and we share it with the general public when we offer the healing exploration of Jungian analysis to patients. We can accomplish none of this on our own. As one of our members wrote recently, we need a “radical interdependency” to achieve our ends. Jung founded the first Analytical Psychology Club in Zurich 1916 so that people who were undergoing Jungian analysis could learn even more about themselves through their engagement with others. He expected it to be messy–and it was. He expected us all to deepen our understanding of ourselves through the challenges that community offers. We choose to come together as analysts because we can accomplish more as a group than as individuals. And this is the best place to develop Jung’s ideas, to develop them as we learn from others, both within and outside of the Jungian world. But it also forces us to rub up against one another and learn from the personal experience. We hear other perspectives and enlarge our own. We challenge and support each other in our growth. It’s messy and frustrating. It takes time and energy, but it’s worth the investment. It’s an essential ingredient in individuation and life. “It is obvious that a social group consisting of stunted individuals cannot be a healthy and viable institution; only a society that can preserve its internal cohesion and collective values, while at the same time granting the individual the greatest possible freedom, has any prospect of enduring vitality. As the individual is not just a single, separate being, but by his very existence presupposes a collective relationship, it follows that the process of individuation must lead to more intense and broader collective relationships and not to isolation. . . . Under no circumstances can individuation be the sole aim of psychological education. Before it can be taken as a goal, the educational aim of adaptation to the necessary minimum of collective norms must first be attained. If a plant is to unfold its specific nature to the full, it must first be able to grow in the soil in which it is planted. “[Anyone who pursues individuation] must offer a ransom in place of himself, that is, he must bring forth values which are an equivalent substitute for his absence in the collective personal sphere. Without this production of values, final individuation is immoral and–more than that–suicidal. The man who cannot create values should sacrifice himself consciously to the spirit of collective conformity. In so doing, he is free to choose the collectivity to which he will sacrifice himself. Only to the extent that a man creates objective values can he and may he individuate. Every further step in individuation creates new guilt and necessitates new expiation. Hence individuation is possible only so long as substitute values are produced. Individuation is exclusive adaptation to inner reality and hence an allegedly “mystical” process. The expiation is adaptation to the outer world. It has to be offered to the outer world, with the petition that the outer world accept it. The individuant has no a priori claim to any kind of esteem. He has to be content with whatever esteem flows to him from outside by virtue of the values he creates. Not only has society a right, it also has a duty to condemn the individuant if he fails to create equivalent values, for he is a deserter. . . . But inner adaptation leads to the conquest of inner realities, from which values are won for the reparation of the collective. Individuation remains a pose so long as no positive values are created. Whoever is not creative enough must re-establish collective conformity with a group of his own choice, otherwise he remains an empty waster and windbag. Whoever creates unacknowledged values belongs to the contemned, and he has himself to blame for this, because society has a right to expect realizable values. For the existing society is always of absolute importance as the point of transition through which all world development passes, and it demands the highest collaborative achievement from every individual.” CW Vol. 18 Para 1095-1098.